Whether you're moving into a new place and looking to finally get your cutlery organized, or you just want to reduce clutter; drawer dividers are a great way to keep yourself organized. But what drawer dividers are the best for you to use? We will be examining some of the best drawer dividers to help you decide which one is the best for your purposes. 1. What Are Drawer Dividers? Drawer dividers are a wooden or plastic device with several slots to help you organize your drawers. They can be used for utensils in your kitchen, office supplies, clothes, your bathroom's toiletries, or that one drawer everyone has that is filled with miscellaneous household objects. They can be customizable, and they come in a variety of different shapes. 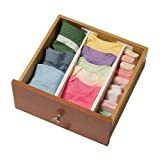 They are primarily used to keep your drawers organized, and they provide a certain amount of freedom to help you use your own organizational methods to keep things where you want them. Some drawer dividers have a pre-existing layout that you can fill out as you see fit. Others are more customizable in their functions. Some merely serve as screens to help keep the drawer itself divided into halves or thirds, others are interlocking in ways that can be adjusted as the owner sees fit. 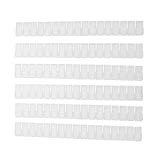 Most varieties of drawer dividers can be purchased on Amazon. You can also purchase drawer dividers at major retailers like Walmart or Bed Bath & Beyond. Most drawer dividers that are being sold on Amazon tend to go for prices approximately between $10 to $30. The following products were reviewed based on their features, their pros and cons, and their price. We also provide links to Amazon to purchase them. We came up with the following selection of drawer dividers based on careful research via Amazon, with a focus on testing a wide variety of products that can be used for a variety of different functions. This will allow us to give you the best on the market in specific fields while also determining which is the best overall. The approximate price range for drawer dividers tends to be between $10 and $30. The more expensive sets are usually among the largest ones, along with occasionally being made of higher quality and environmentally friendly materials. They will also generally last the longest due to wear and tear on the product, and may have additional features. Key Features of this product include a main compartment that is 14 inches long, but that can be expanded to 17.5 inches if you need some more additional space. It is 2 inches deep and is generally designed in its layout to be used for cutlery. It is made of environmentally friendly bamboo, and it is noted for its strong construction. 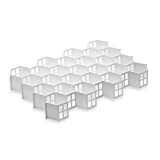 ​Key Features of this product include eight sets of plastic bins that are designed to be interlocking. They come in three separate sizes: three smaller squares (3" x 3"), three slightly larger rectangles (9.1" x 3"), and two of the largest rectangle size (9.3" x 6.3"). They are all 2 inches deep and designed to be reconfigured to your needs. The customer can set up the configuration that is appropriate for their needs, although reviewers have noted some difficulties in actually utilizing the interlocking feature. ​​Key Features of this product include its focus on office supplies, which is made up of four small square compartments and two larger, rectangular ones. It is 2.5 inches deep and made of a sturdy black metal mesh. It measures 12" x 15" in length and width, making the two larger compartments good for longer objects such as staplers and writing utensils. The smaller compartments are best for supplies in the vein of tape, white-out, and paper clips. ​​​Key Features of this product include six boxes of varying sizes that are primarily designed to hold clothing. They are made of a fabric that resists mold and moisture. All are 5.125" deep. You receive two smaller squares (5.5" x 5.5"), two smaller rectangles (11" x 5.5"), and two larger squares (11" x 11"). They are collapsible and can be cleaned with a damp cloth. ​​​​Key Features of this product include four bins, all 4.25 inches deep, designed to store fabrics. They resist mold and are designed to be fit into your bureau. One of the bins is divided into six rectangular cells, and it is meant to store ties and scarves. The second has seven rectangular cells, and it is designed for bras, although some customers have complained that larger cup sizes will not fit properly. The third has eight square compartments, and the fourth has 24 smaller ones, both designed for underwear and socks. ​​​​​Key Features of this product include two adjustable spring-loaded dividers. There are two varieties. One is 2.5" high and can be adjusted from 17.75 to 21.75 inches. The other is 4.5" high and can be adjusted from 13 to 18 inches. They both have rubber pads at each end to prevent damage to the drawers, and they do not require any tools or setup. 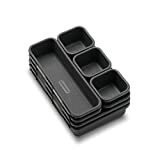 They are designed to be simply placed into your drawers to provide a barrier for organization's sake. 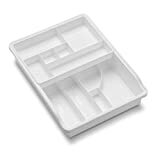 ​Key Features of this product include a clear acrylic tray divided into smaller sections of varying sizes. It is 8" long and 1.25" deep, meaning it is designed to be used for smaller cosmetic products in a bathroom. The width starts at 11.25 inches but can be expanded to 18 inches if you need it. It comes in additional colors if you do not like the clear coloring. ​​Key Features of this product include eight plastic pieces that are snapped together to form 32 honeycomb shaped compartments. It is about 14" long, 19.5" wide, and 3" deep. However, the size can be adjusted with a pair of scissors if you so choose, making it able to potentially fit any drawer. It is primarily designed to store clothes, such as socks and underwear. However, the unusual shape and wide variety of compartments mean it is fairly versatile for other items. Makes your house neat and organized in a few minutes. ​​​Key Features of this product include six plastic drawer dividers. They are notched so that they can overlap and be locked into each other. They are 43cm x 5cm - 16.93inch x 1.97inch, but they can be trimmed with scissors if they are too long for the drawer in question. They are extremely thin, which means you can likely fit plenty into the drawer on top of each other. Junk Drawer Organizer is a federally registered trademark. 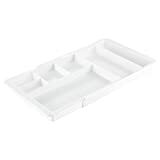 ​Key Features of this product include a white plastic drawer divider with two layers. The top layer slides away to reveal the bottom one, and both have compartments of varying sizes (the top does not match the bottom). It is 3" high, and 15" x 11.5". The top layer is more focused on smaller square compartments, while the bottom has the larger compartments. 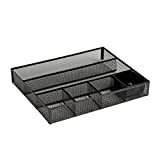 This makes it ideal for organizing a wide variety of office supplies. ​The best drawer divider for you depends on what you are searching for. For cutlery, we highly recommend the Home-it Expanded Cutlery, which has all the features you could ask for in drawer dividers thanks to its expandability, sturdiness, and easy storage for all. We might call this the best all-around, although the best options for non-cutlery use tend to be more specialized. You can't exactly use a cutlery divider for clothes. For office supplies, we recommend the Rolodex Deep Desk. It allows you to keep almost all your office supplies in one place while being designed in a way that allows you to see them all at once, allowing you to quickly and efficiently grab what you need. An organized desk drawer is important for efficiency. For clothing, we think the best option is the Dream Drawer Organizers. They may be simpler than the wider variety offered by some of the other clothing-specific options, but we think that the variety of sizes offered is the real bonus, and they help keep the process of organizing simple. For any random assortment of goods, we prefer the Made Smart Interlocking Bins. Despite the interlocking feature not working perfectly, the ability to arrange the bins to your choosing and allow them to fit unusually shaped storage spaces makes them ideal for a more random assortment of objects looking to be organized. Hey Buddy!, I found this information for you: "Drawer Dividers: Top 10 Ingenious Picks". Here is the website link: https://www.explodedhome.com/10-drawer-dividers/. Thank you.